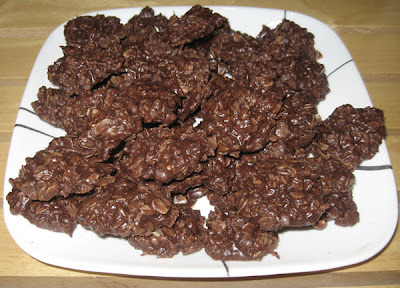 Some people call these cookies Chocolate Macaroons, others refer to them as Boiled Cookies... Whatever you call them, they are delicious. My family has been making them for as long as I can remember, and darnit if they aren't just MMmmm. Once you have it all stirred in, remove from heat. Place spoon size globs of the mixture on a waxpaper covered cookie sheet... The blogs can be as big or as little as you want them to be. I make them big when just for a few people and small when I'm feeding the masses. 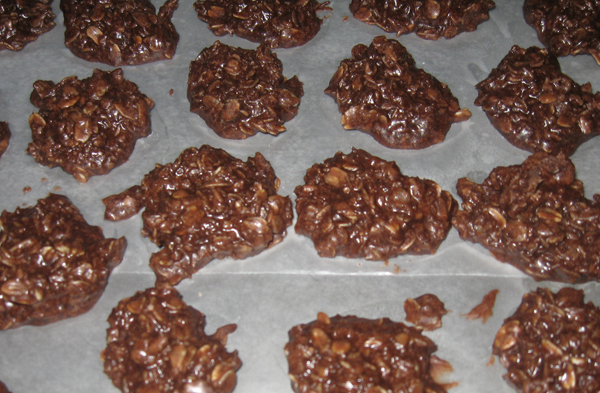 The macaroons should be relatively dry once cooled and will crumble when you chew them. If you don't boil them long enough they will end up rather sticky; the shticking to teh woof of your mouf like peanut budder... kind of sticky. Enjoy and Have Yourself a Very Merry Christmas!! I have been making these for 40 years.....easy and delish!